Adjustments to policies and laws have seen Vietnam's tourism sector truly begin to boom. The year-on-year increase of nearly 30 per cent in Vietnam’s tourism sector last year was not only the highest ever but also put the country among those with the fastest tourism development for the first time. The impressive growth mostly stemmed from changes to policies to develop tourism into a spearhead economic sector by 2020. 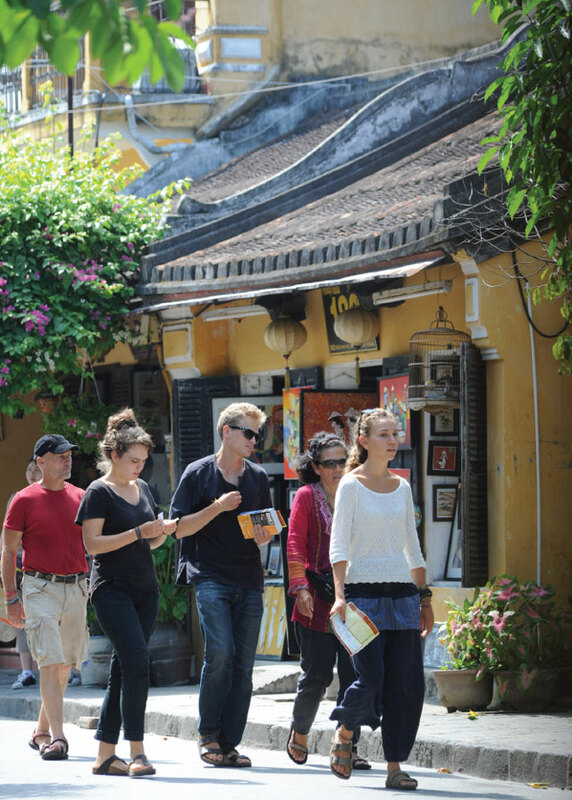 Vietnam welcomed 12.9 million international visitors in 2017; an unprecedented increase of nearly 30 per cent, according to Mr. Nguyen Van Tuan, General Director of the Vietnam National Administration of Tourism (VNAT). It also catered to 73 million domestic travelers, up 18 per cent. Total revenue was estimated at more than VND510 trillion ($22.4 billion) and the sector contributed some 7.5 per cent to Vietnam’s GDP. It ranked sixth in the world’s fastest-growing tourist destinations in 2017 and led in Asia in terms of tourism development, according to the United Nations World Tourism Organization (UNWTO). The strong growth in 2017 was in large part due to positive changes within the government’s massive plan to develop tourism into a spearhead economic sector, according to Mr. Tuan. The plan was compiled when Vietnam welcomed 10 million international visitors for the first time and 62 million domestic tourists in 2016; far surpassing annual targets. Vietnam introduced a pilot of electronic visas for foreign citizens from 46 countries worldwide in early 2017, cutting the application time for a 30-day visa down to just three days. Such visas do not require letters of guarantee or invitations and are for entry and exit at international border gates. It also extended visa exemptions to citizens from five Western European countries - the UK, Germany, France, Italy and Spain - for 15-day stays. Expanding the policy to other countries is being considered for June and the duration will increase from 15 days to 30 days. Another important change is the amended Law on Tourism 2017, replacing the Law on Tourism 2005 and including a range of new features with a tourist-centric approach. The new law adds more requirements for businesses involved in tour operations and hospitality, with standards in facilities, staff and professional skills. It also encourages related services such as transportation and food, not only at tourist sites as previously but everywhere. Enhancing the quality of tourism services and protecting the rights of tourists are also contained within the new law. Tour guides are also subject to stricter requirements under the new law, including the need for international tour guides to have at least a university degree and local tour guides at least a college degree. Tour guides also need to have employment contracts with travel or tour guide providers or be members of a professional tour guides’ association. “Since the 2017 Law was introduced, the quality of Vietnamese tour guides has improved in professionalism and foreign languages,” said Mr. Ky. Moreover, the Tourism Development Support Fund, an off-budget State fund, has been established to help promote local tourism inside and outside of the country, research markets, develop human resources and new products, and market and raise awareness among the community about tourism development. Creating new tourism products is given more attention, particularly the focus on the involvement of local communities in tourism development. This forms the basis for growth in community-based tourism, not only promoting the strength of indigenous cultures but also helping to stabilize local people’s lives. Different types of luxury travelers have emerged in recent times, such as “bluxury” travelers: those who travel for business but also take time to discover the country, according to Ms. Esther Delbreil, Online Marketing Executive at Luxury Travel, another leading local tour operator. Slow travel, sustainable tourism, wellness and spa, and multigenerational travel also count among the trends to emerge. “We therefore designed itineraries that cater to this changing demand,” she said. “We have many new ideas on how to create tours that show off different parts of Vietnam never seen before, such as the banks of the Red River in Hanoi and the northern region, while Lang Ha Bay has been included in our cruise itinerary this year and we plan to keep exploring this region. Our 2018 Lux Signature Tours provide all-luxury experiences based on exclusivity, the ultimate in sophistication, and privacy.” She emphasized the important role of developing tourism in a sustainable manner, conserving and promoting cultural heritage and values, protecting the environment, and maintaining security and safety. Meanwhile, Mr. Ky suggested further cooperation between tour operators, airlines, hoteliers, investors and local authorities in different fields to comprehensively create diverse new products. A wider range of entertainment services and facilities such as casinos, night clubs and bars in major cities would also attract more tourists and stimulate spending. 2017 also saw a series of large-scale and high-quality real estate projects in tourism from major players such as Vingroup, the Sun Group, the Muong Thanh Group, the FLC Group, the CEO Group, and the BIM Group in the popular coastal destinations of Da Nang, Nha Trang and Phu Quoc Island, according to Mr. Tuan. “These will change the image of Vietnam’s tourism in these key destinations,” he said. Another important factor helping promote Vietnam’s tourism over recent years has been the launch or greater frequency of direct flights connecting popular destinations in Vietnam and other countries, such as Hanoi - Sydney, Da Nang - Hong Kong, Da Nang - Seoul, Hanoi/Danang - Osaka, Hanoi - Nanchang (capital of Jiangxi province in southeastern China), Hanoi - Phnom Penh, Ho Chi Minh City - Siem Reap, and Ho Chi Minh City - Phuket and Chiang Mai, by Lucky Air from China, Bangkok Airways from Thailand, and Lanmei Airlines from Cambodia. More international and domestic air routes are being opened under a recent government plan on air transport development to 2020 and vision to 2030, as Vietnam strives to be among the four leading countries in Southeast Asia in terms of air transport volume by 2030. It will see international air routes increase in frequency and more routes opened, including to the key markets of Russia, Germany, France, the UK, China, South Korea, Japan, Thailand, Malaysia, and Australia. New air routes to Russia, the UK, and the Czech Republic are planned to open by 2020, with the United Arab Emirates, South Africa, the Netherlands, and Italy also on the radar. The domestic network will also be expanded by direct flights to destinations where travelers must currently transit in major airports. Research is to be carried out on opening routes to some of the country’s many islands. Vietnam will have 23 airports by 2020 - 13 domestic and ten international - including Noi Bai in Hanoi, Tan Son Nhat in Ho Chi Minh City, Da Nang, and Cam Ranh, in southern Khanh Hoa province and serving Nha Trang, which are the country’s four major international gateways. There is to be 28 airports by 2030, including 15 domestic and 13 international, with the addition of Long Thanh International Airport in southern Dong Nai province, construction of which is expected to begin in 2019 and it will become the country’s fifth gateway upon completion. With the opening of the new airports, air transport capacity is expected increase to around 64 million passengers and 570,000 tons of cargo annually in 2020. By 2030, regional centers for maintenance and the overhaul of engines and aviation equipment will be opened, with Vietnam gradually joining the supply chain of products and services in the global aviation industry. The role of technology and social media is also emphasized as important tools in marketing and promoting Vietnam overseas as a tourism destination. Most tourists now find tourist information and book hotel rooms and airfares online, meaning connectivity and social networks play an increasingly key role, according to Mr. Ky. He suggested that in addition to establishing tourism promotion agencies in key markets that it is necessary to intensify the application of new technology and develop social media to introduce images of Vietnam to international friends. With the effort and cooperation of the government and enterprises, Vietnam targets welcoming 15-17 million foreign visitors and hosting 78 million domestic tourists this year, up 30 per cent and 7 per cent against 2017, with revenue totaling VND620 trillion ($27.3 billion).